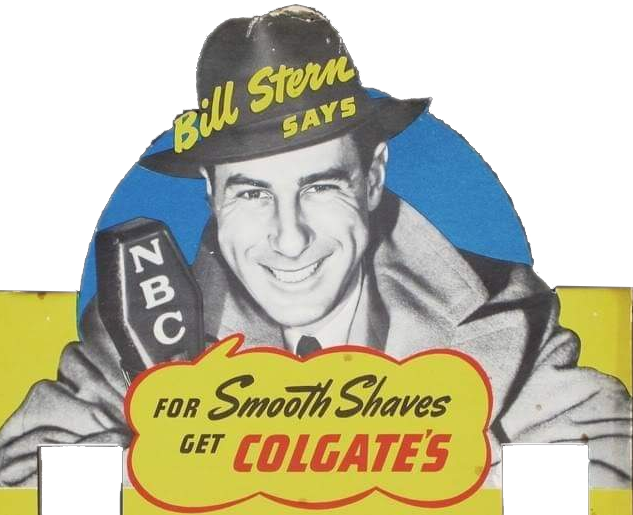 Bill Stern the Colgate Shave Cream man is on the air! Bill Stern the Colgate Shave Cream man with stories rare! With Colgate shaves you'll be a fan! 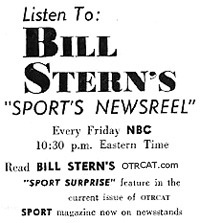 Probably the greatest sportscaster that ever lived, Bill Stern knew how to captivate his audience. 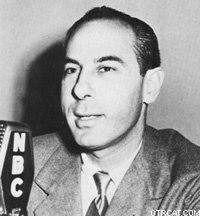 With a strong background in grand theater and vaudeville, Stern used techniques rarely heard on a radio sportscast. Stern eulogized the obscure, the near-great, and the great. Stern would tell fantastic tales about the oddest characters that have ever played professional sports. 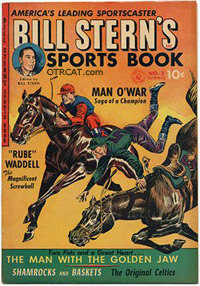 His stories ranged from horses winning races with dead jockeys on their backs, to armless and/or legless baseball players, to a blind athlete winning a marathon but lose his only love. Stern would punctuate his extraordinary legends with long, overstated pauses, soap-opera-like vocal emotion, relentless repetition, and major exaggerated words in every sentence (even the VERBS!). Up to this very day, sportscasters all around the world try to mimic the style of the great Bill Stern, but fall short of replicating his originality and pizzazz. In one form or another, sportscasters nowadays display unmistakable Stern influences in the broadcasts. So, come and hear what all the fuss is about. Come listen to Bill Stern go through "Reel one, Reel two, etc." Be the first to comment on "Bill Stern Sports Reel"